This is a guest post from a patient. I am from Bangalore and in IF land from past 11 years. We had tried multiple stimulation cycles, IUIs, and an IVF without success. We had even tried alternative medicines like ayurveda, homeopathy and Unani but without success. We finally decided to take our next IVF treatment at Malpani Clinic. The treatment from start to end was so smooth here. During the cycle, when doctor told me that embryo transfer will be done without GA,I started shivering and asked doctor to do it under GA only because I am so scared of speculum. Doctor said whichever way I am comfortable but he assured me that ET without GA is really painless. And Sister Lissy also had assured me the same. This gave me the confidence and I decided to try a mock transfer. I was clear that if I had any pain during the mock transfer, I will take with GA option . But why am I so scared about the speculum? There are some horrific stories behind it. 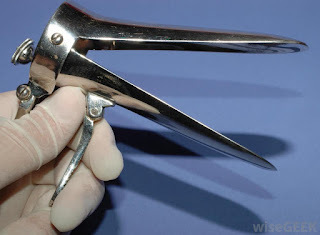 My first encounter with speculum was during first IUI cycle in Bangalore. That doctor left me with the speculum inside for one hour in an air conditioned operation theatre after the IUI . It was quite painful, I was not able to walk after that for rest of the day. Second IUI was at a different renowned clinic. I made up my mind to face the pain with speculum and started breathing exercises to keep myself calm. The doctor doesn't like this and she asked me to stop it. Another encounter with speculum was during my first IVF mock transfer at a different popular clinic. Jr. doctors and nurses tried different instruments on me to do a mock. There was no human touch in that and for them I was a specimen. I screamed out like anything with pain. So for first IVF, I opted for ET with GA. These 3 incidents formed a very scary picture on my mind and speculum word itself brings shiver to my spine. BTW, till now all the clinics wherever I went, either nurses or Jr. Doctors only prepare the patient for procedure. Finally, on the day of mock transfer at Malpani Clinic, I was so scared. Entire staff is very very nice and made me so comfortable in OT. Dr. Malpani came in and heard my stories and he assured me that everything will be fine. He called my husband also inside the OT. Doctor asked his assistant to play Tom & Jerry cartoons for me on a tablet ! I was watching Tom & Jerry, my husband was standing next to me for support. What more can I ask for? I was totally relaxed. The mock transfer took about 15 mins and all I did was follow Doctor's instructions . At one point of time, I had a cramp on my left hip, and he immediately paused the procedure. He asked me to relax and resumed only after I was OK. After the mock transfer there was a slight discomfort for a few mins and I was fine. I decided to do the Embryo transfer without GA.
From my experience, I noticed that some Yoga also helped in the overall process by making hips flexible enough. Two asanas helped me in the process: Titli (Butterfly) asana & Sarvanga (Shoulder stand) asana. Hope this should be useful for other women as well. While this patient may feel she was being a coward because she was scared of the speculum, the reality is she was very brave, and was willing to go through the IVF treatment, even though she was petrified. This is my definition of courage ! The site at http://web.archive.org/web/20110725075247/http://www.vaginismus-awareness-network.org/ is very helpful !